Want to know what my latest favorite Etsy shop is? Edelweiss Post. 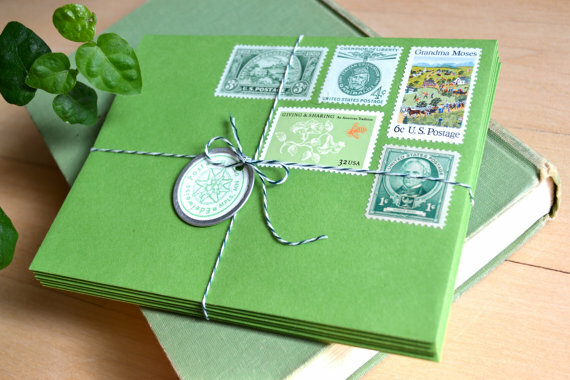 It's a store selling notecards and envelopes that come with postage stamps already applied— unused vintage ones, carefully selected and arranged by theme or color. Edelweiss Post is run by Patrick in Minneapolis. 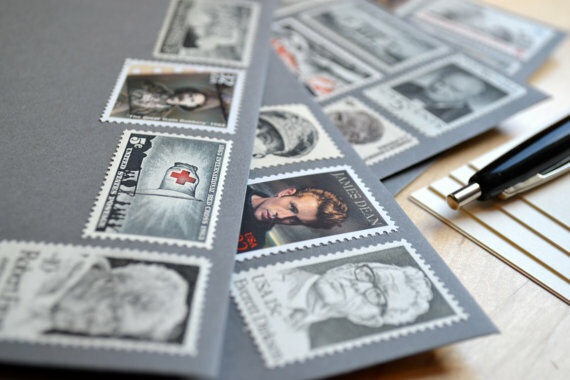 His grandpa collected stamps, and Patrick is carrying on the tradition by constantly adding to his own collection, and then making them available to everyone. I think it's brilliant. Of course I bought an orange set. And sent my dad a manly-themed card and envelope for his birthday. If you're going to buy somebody a card anyhow, why not go for something totally unique with vintage appeal? These look and feel really special. You can choose sets by color. Or by theme. Mad Men Manly Mail? How about guys with beards? The US postal service seems to favor facial hair. Visit the shop to see more themes. Holidays. Owls. Nurses. Hot air balloons. There's even a Great Gatsby set. Every pack comes tied with baker's twine and packaged so beautifully you'll hate to tear it open. If you need a custom-themed set, Patrick will do his best to make it happen. Maybe something for wedding announcements or party invitations? One customer used an orange set to send thank you notes to the people who interviewed him for a job. He got hired. Keep that in mind, friends. 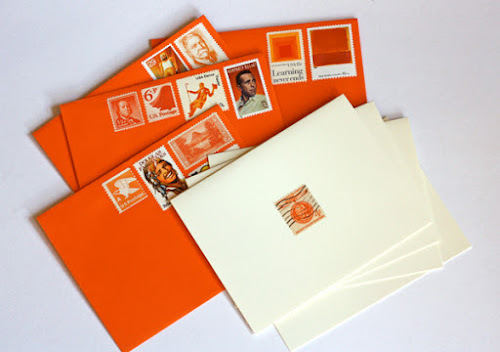 You can't go wrong with orange, especially in the form of stamps. Yeah, that was a pretty cool card and envelope you sent your pa! The stamps were very interesting! It's funny you should post this because just today I came across a shop selling vintage stamp stationary too. What a great idea! What a wonderful idea. My grandfather used to see how many stamps he could use on a letter. He had a huge collection. I love this! My grandfather collects stamps and he passed it on to me (though I mostly just enjoy them). 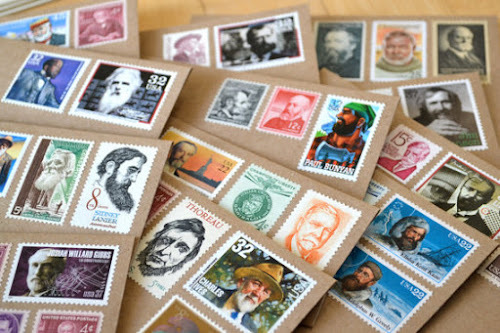 He would do the same thing- fill an envelope with vintage stamps and mail it to me because he knew I'd enjoy it. I'll have to pass this along to him! Thanks so much for reminding me of that. I love this idea. Totally checking it out for father's day! Thanks for sharing. Patricks cards are amazing! I have bought several sets from him and get tons of compliments when I give a "Patrick" card to a friend. This is amazing! What a wonderful idea - thank you so much for sharing. I am from Australia but I still appreciate the effort and the detail. I wonder if there is a similar Australian based store? Awesome post, super great product, collector's items for sure (let us hope the intended realizes that part). :-) Thank you for sharing! Awesome find!!!! Absolutely love this idea, cant wait to check out the shop! Ah, the James Dean stamp. For years, I had the poster of that stamp in my room, thanks for the memories! What a great idea. 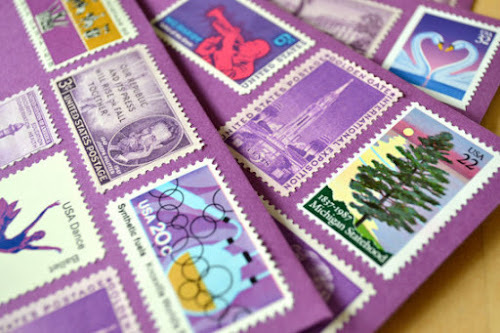 I have a hoard of stamps and couldn't think of a way to recycle them. This will do nicely.